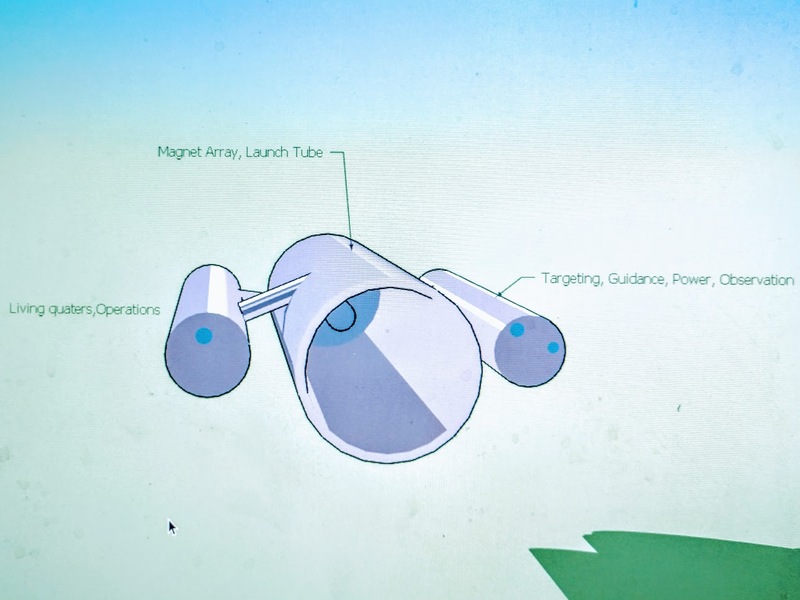 I've perused some of the articles and questions on magnetic acceleration using rail guns and they all seem to say that it's possible just not practical. I wanted to know what are the drawbacks to building an orbiting rail gun and using it to accelerate a ship or satellite to a reasonable distance to the target before using more conventional propulsion? That negates the drawbacks of atmosphere, does it not? I've added a rudimentary image to help illustrate what I was proposing. The station would be built in LEO and the payload would be protected by a magnetically shielded fairing which would be ejected after launch. After gaining the acceleration the payload could make slight course corrections or boosts as needed until it reaches it's target where it could then do an orbital insertion or brake for landing. Concepts for mass-drivers or railguns situated on the moon exist. What you're asking about is a mass driver space station in low earth orbit that a payload or ship launched from earth can dock with, and then be propelled into deep space. The delta-V needed to go from LEO to an escape trajectory is about 3 km/s, and to go from there to a Hohmann transfer to the outer reaches of the solar system requires a further 5 or so km/s. I'm sure a mass driver could be made to provide such delta-Vs, though it would have to be rather long in order to not smush the payload with its massive acceleration. One big problem I see is Newton's third law. Due to recoil, the orbital mass driver will have the same momentum backwards as the craft will have going forwards. This means its orbit will be altered. If the mass driver is much heavier than the mass it accelerates, this won't result in a delta-V change too great, but it's conceivable even a small change could put it into an orbit that intersects with earth's atmosphere. Now you could counteract this by sending up a refueling rocket so the mass driver station can burn to negate the delta-V change, but I feel like if you're going to do that, you might as well use that fuel to accelerate the craft directly, without the mass driver. The other alternative is that you launch a different probe in the opposite direction with the same momentum as before, but the coincidence of having two probe missions with exactly the opposite delta-V requirements is... unlikely to say the least. Let's look at some numbers. For the sake of argument let's target a delta-V from the railgun of 4 km/s enough to get to low lunar orbit or Mars transfer orbit. If the railgun is 1km long, that would mean an acceleration of about 800g for half a second (using $v^2 = 2as$ and $s = 1/2 a t^2$), so, more than a little uncomfortable for humans, and imposing some restrictions on the design of unmanned payloads. Per kilogram of payload, this also means an average power of about 16MW during the launch, so we're going to need some chunky capacitor banks. This delta-V would have to be prograde (forwards along the orbit of the launcher). Launching a payload that is initially stationary with respect to the launcher in any other direction would require a much higher delta-V to reach the same targets. A satellite in LEO will reenter within an hour if it is slowed in its orbit by as much as 90 m/s (that's for the ISS orbit, your mileage may vary). So to avoid this happening we either need to be able to reboost the launcher within a few minutes of a launch, or we need the launcher to mass at least 50 times the payload mass. One possible solution is to launch payloads that are not initially stationary with respect to the launcher. For example a payload in the same orbit, but moving in the opposite direction could be launched to the moon or Mars transfer with a delta-V of 4 km/s retrograde to the launcher, thereby reboosting the launcher. However that requires the payload entering the launcher accurately at 14 km/s relative velocity and, because it is in the launcher much less long the acceleration and power needed are higher -- about 12800g for about 60 ms, and a power per kilogram of 2GW. These seem like fairly insuperable problems. when you have a cheap way to reboost the launcher frequently. For the purpose of orbiting other planets; this solution adds lots of complexity, without (almost) any benefit. Since the added benefit is only to reduce the propellant needed on the probe, this sounds like a VERY high price to pay. Not the answer you're looking for? Browse other questions tagged acceleration rail-gun or ask your own question. Would launching a shuttle from a 45 degree angle be the most fuel efficient for a rail gun?